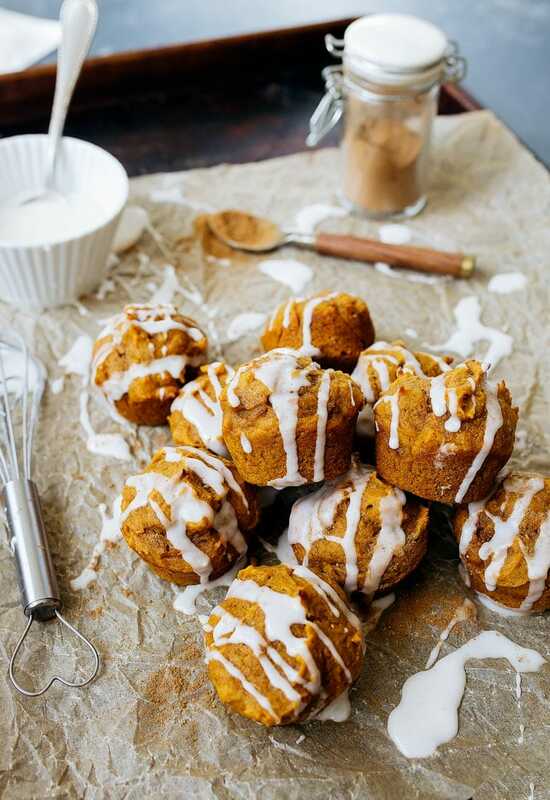 Mini pumpkin cakes: instead of a huge pumpkin sheet cake, ya know? Lately, I’ve seen so many recipes for pumpkin sheet cakes on the internet, and, well, that makes me want to eat an entire pumpkin sheet cake. This pumpkin sheet cake looks perfect, but if you told me I could only have one recipe for pumpkin sheet cake for the rest of my life, I would probably reach for this one (because one-bowl + browned butter!). But, um, I live in a small batch dessert world. Your girl cannot be trusted around a giant sheet pan cake. (‘Cuz ya girl would slice off inch after inch all day long and, suddenly, the pan would be empty by 8pm). Once, I made us a mini sheet cake to avoid this problem (and I called it the Texas Chocolate ‘Quarter’ Sheet Cake), but it still made six servings. While six is definitely better than 16, it’s still a bit much. SO, I came up with a way for us to get our pumpkin cake fix without making 16 servings. How about two servings?–sounds better, right? 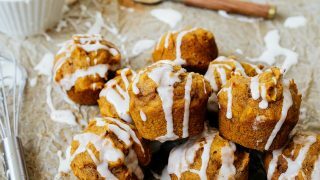 This recipe makes 10 mini pumpkin cake bites. At first, that sounds like a lot, but if I split this with my husband, that would be five cake bites each. Honestly, if a day passed by where the only dessert I consumed was five bites of cake, I would call that day a success. That’s about 10 fewer bites of dessert than I normally consume in a day. I like to work out, have I told you? 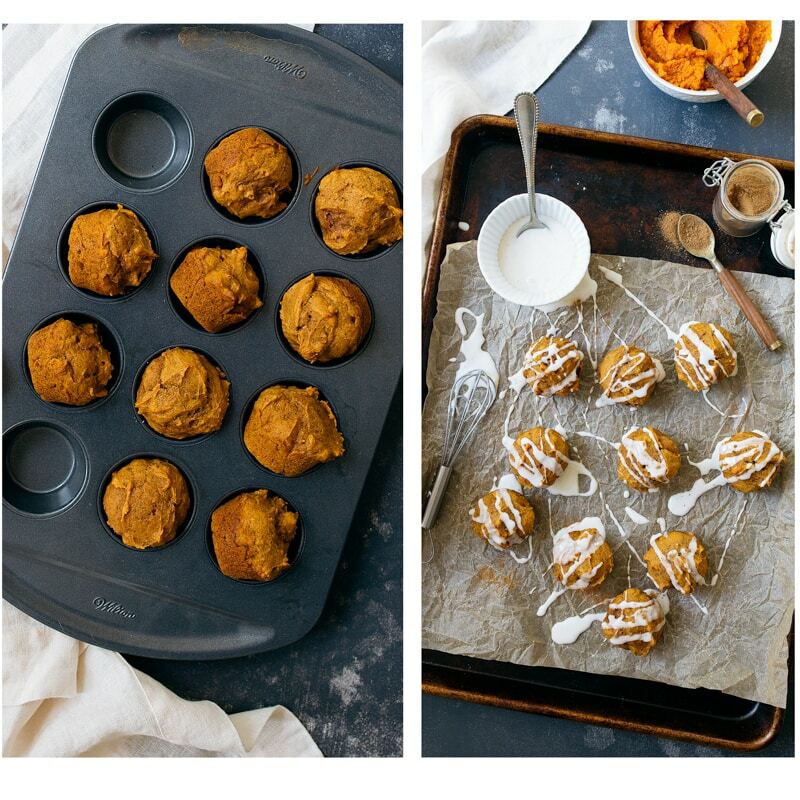 Moving on, these mini pumpkin cake bites are adapted from my recipe for mini banana bread bites in my second cookbook (the savory one! ), Comfort & Joy: Cooking for Two. I substituted the mashed banana for 1/2 cup of canned pumpkin puree, and kept everything else the same. Oh, wait–I added a teaspoon of pumpkin pie spice, because you really can’t bake anything without it during Fall. Other than that, the recipe is identical. 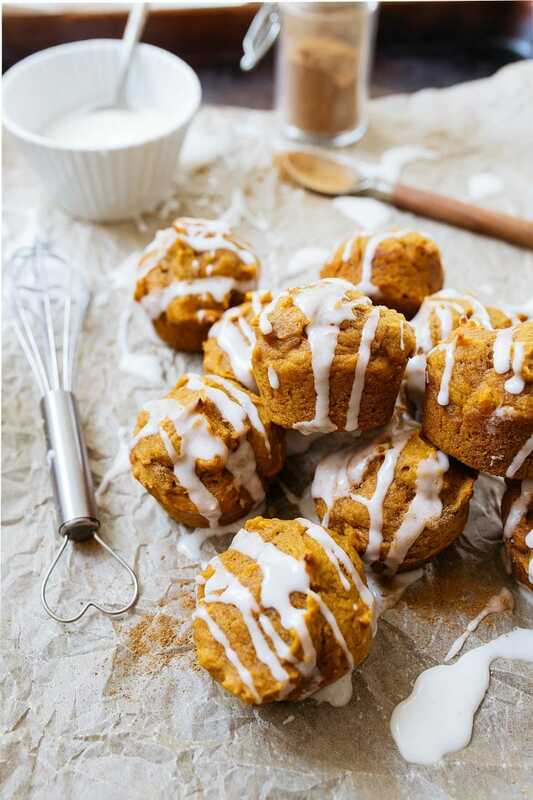 I used a mini muffin pan to make these bite-sized and poppable mini pumpkin cake bites (here is the exact pan I used). Mini pumpkin cakes with thick glaze. Small batch! Spray 10 wells in a mini muffin pan with non-stick spray. In a small bowl, whisk together the pumpkin puree, melted butter, sugar, honey and egg yolk. Mix very well until blended. Sprinkle the flour, pumpkin pie spice, baking soda, and pinch of salt on top. Gently stir together, just until no streaks of flour remain. Divide the batter into the 10 cups, and bake for 14 minutes. (Use a toothpick to ensure they're done before removing from the oven). Let the mini cakes cool completely, and then remove from the pan. In a small bowl, whisk together all of the glaze ingredients. It will be thick, but if it's not thin enough to drizzle, add a little more cream a splash at a time. Drizzle the glaze over the mini cakes and serve. *This recipe uses only an egg yolk. Check my list of recipes that use an egg white! I agree – those pumpkin sheet cakes are gorg but unless I have a small army of friends around to feed, I cannot be trusted with a whole sheet cake. Will this work in a 6″ pan? I’d like to make a mini pumpkin birthday cake. So enjoy your site. I adore baking and have struggled with over-sized desserts for years. Used to bring the “extras” into the office, but now that I’m retired, well, if I hadn’t found your site, we’d be in trouble! I love how easy you make it to print your recipes. THANK YOU!